The way that technology is now a part of our daily lives is extraordinary. Who would have thought that you could have a map, a GPS tracker, pedometer and a telephone in the palm of my hand today? The race for manufacturers to create devices that we can wear is becoming more prominent in our daily lives. When Nike teamed up with Apple 7 years ago with the Nike+ system to keep track of runs, it helped the sportswear giant develop a greater connection with their customers (pun intended) by creating products that utilised this system. It also helped Apple to tap into Nike’s market though their synergistic ties, developing apps and hardware that enabled owners to track their runs, map routes and sync their music with their workouts. Nike further extended their adventures in technology by releasing the FuelBand and setting up the Accelerator program in 2012, aimed at leveraging their technology through their API and SDK for Nike+. Google are planning to gain a foothold through the creation of Google Glass, an augmented reality device worn as a pair of glasses that displays information to the user in a similar format to a smartphone, operating via voice-activated commands. Such a device offers many application and product collaboration opportunities for Google. By marrying technology and fashion through Glass, manufacturers can create products with aesthetic appeal that target a new customer demographic, or adapt their current range of products to accommodate Glass, thus extending the lifecycle of eyewear products in developed markets. Despite the potential possibilities that Google Glass presents, there may be some drawbacks regarding Glass’ functionality, most notably the privacy issue. The trade-off with ‘free’ internet services such as Google, Twitter and Facebook is that your input (personal data) becomes a commodity that such services use to generate advertising revenue through the creation of targeted, personalised ads. Furthermore, being tracked using such products like Glass does raise personal security concerns about who has access to the data and how it is protected. A Fast Company article outlines a list of places that are likely to be resistant to the use of Glass in certain public and private places. What does it mean for marketers? Marketers need to consider whether wearable tech is relevant to their company activities. Architecture and design companies, outdoor adventure or athletics companies may find wearable tech products useful to their business, for instance, especially in terms of the different functions and options that such technology provides. Another consideration is whether wearable tech complements their target market. Such products could be seen by a company’s target demographic as pointless or a privacy infringement. Conversely, they could embrace the technology and see it as way of simplifying daily activities, perhaps even provide opportunities to discover new things they would not have thought about. Either way, wearable technology is not going away any time soon, and I believe that if Google can strike the balance between protecting customer privacy and providing a purposeful product with numerous applications, they could make the world a much smaller place. This entry was posted in Advertising, Branding, Trends and tagged Apple, Data, Google, Google Glass, Nike, Pebble Watch, Privacy, technology, Wearable Tech on May 21, 2013 by Chux. Can social data be a useful tool for music artists? A good example of this of social data being used for marketing purposes is Lady Gaga, who is one of the most effective users of social media and has a very large and engaged following, uses social data derived from Spotify to personalise gigs and understand her fan’s preferences for her music. Could this be a useful tool for emerging artists to use as part of their own marketing? Whilst the returns for music seem to be smaller due to high levels of piracy, emerging and aspiring artists are seeking innovative and different ways of getting their music out to the masses. Sites such as Musicmetric and Kickstarter are platforms which provide control for artists over their projects, in terms of funding, marketing, promotions and sales, and connects them to brands as well for extra exposure. In terms of data, the analytical tools such web services provide for artists are useful insights into their fans, and also a comparative understanding of how benchmark industry data can be used as a means for effective marketing and promotions campaigns. 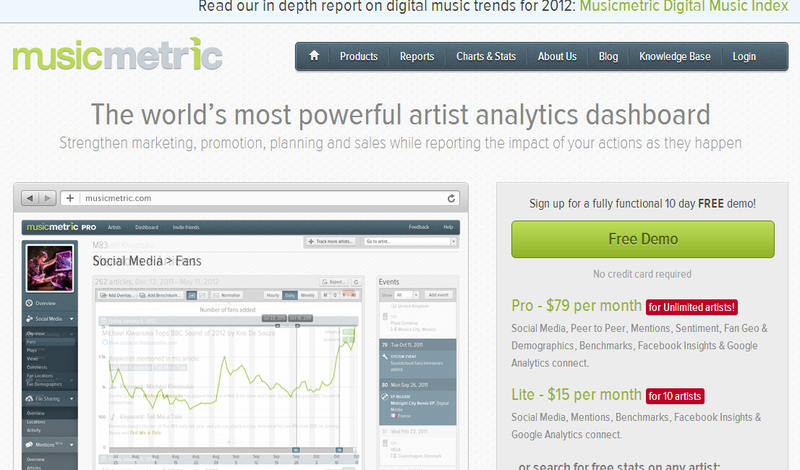 Musicmetric – the future for independent and aspiring music artists? So is social data the way forward? Lady Gaga could be providing the questions…. This entry was posted in Internet, Social Media, Trends, Websites and tagged Analytics, Data, Independent Artist, Kickstarter, Lady Gaga, Marketing Tools, Music, Musicmetric, Personalisation, Promotion, Sales, Unsigned Artist on November 1, 2012 by Chux. 1. Will Facebook be able to generate sustainable revenues from mobile? Since Facebook has gone public this year, there has been some questions regarding their mobile strategy. Monetizing mobile for the social media giant is a challenge, especially for their advertising model and keeping the fine balance between enabling users to have a great user experience and ensuring their privacy on the platform. Other challenges come from their rivals, such as Google and Twitter who also have some traction on mobile platforms. I’m interested to see whether Facebook can find the solution for mobile, which I believe such a fragmented and personal platform in terms of the data stored on devices and the different versions and types of operating systems on mobile (Apple’s iOS, Google’s Android, BlackBerry OS, Windows Mobile OS). 2. Does big data for governments and NGOs lie in the hands of brands? After Felix Baumgartner freejumped his way into the Guinness record books about two weeks ago, I had an interesting discussion with a friend about the event and how what can be learnt from a marketing perspective. A great piece about the Red Bull Stratos project from Nicola Kemp highlights some valuable lessons that marketers can learn from the event, but looking beyond that, my friend and I looked at an area which is also playing a significant role within modern marketing – data. With Virgin exploring the possibility of space travel being as commonplace as regular flights on earth, the amounts of data that can be generated from such ventures may prove valuable for governments looking to extract and interpret data that may prove useful for years to come. Red Bull’s Stratos Project demonstrated how to push the limits of the human body and raised questions about the possibility of pressure suits at high altitudes and single capsule space travel. Who knows? Well, these are my CTM questions to ponder for this series. If you have any suggestions or ideas, please comment below and contribute to the discussion. Also direct questions to me on Twitter @ChuxOnye. This entry was posted in Advertising, Branding, Social Media, Trends and tagged Branding, Data, Facebook, felix baumgartner, Mobile, mobile platforms, Red Bull, Social Media, technology on October 26, 2012 by Chux.